I told you I finished my hat. Toboggan. Beanie. Whatever you call it in your region. But I didn’t show you. There are two mistakes but you’d never know unless I told. OK, so one is that it’s a tad too short. 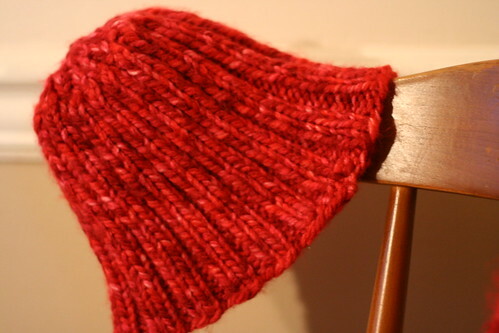 My first hat… with chunky yarn… it was bound to happen… but dually noted. The other mishap is that I “short knitted” (I think that’s the term PodMate used) and added two extra rows to about 3 inches of hat. But who cares. I don’t. 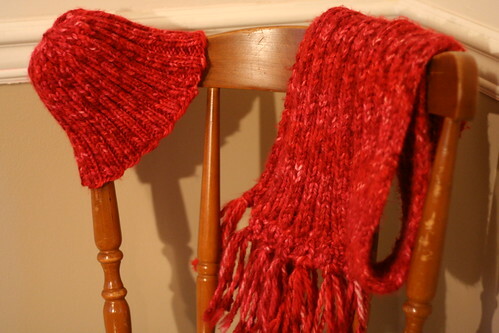 It’s done and it’s cute and it matches my ribbed-for-her-pleasure scarf perfectly. That happens when you use the same yarn and the same k2 p2 pattern. You see what I did there? I used knitting lingo. I’m casting on, my crafting friends. Ha ha! I can’t help myself! I know – I’ve become an addict. A knitoholic. But I like it. And so does my mom. 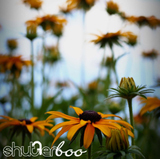 ~ by shutterboo on February 2, 2010. Yay, another knitaholic! 🙂 I’m sorry we didn’t get to do the photo shoot yesterday, but these pics look great! 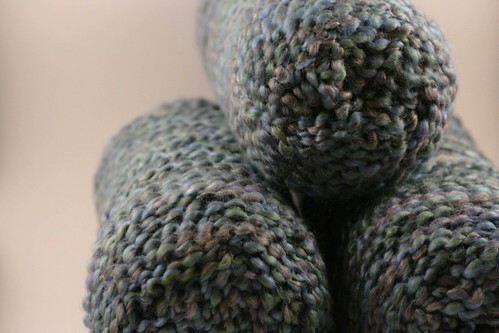 And you were close – you knitted short rows, but you can’t even tell! I promise! I knitted myself a skirt when I was in middle school. I thought it was really cute. I think I won a blue ribbon for it at the county fair!!! Yeah yeah – we always called a winter hat a tobaggan but after working with so many different people from the midwest and northeast, I just call it a hat now. I can’t take the teasing. I love the color of your new string! It’s a tobeanie. And it’s awesome.